It's back! Read the info below, register, grab your Santa suit, your family and friends and come along to our well-loved charity fun run/jog/walk in Sturminster this December! The season of good cheer is set to begin merrily and bright again this year with Sturminster Newton Rotary’s festive, fun and friendly ‘Santa Stride’ community fun run - or walk! 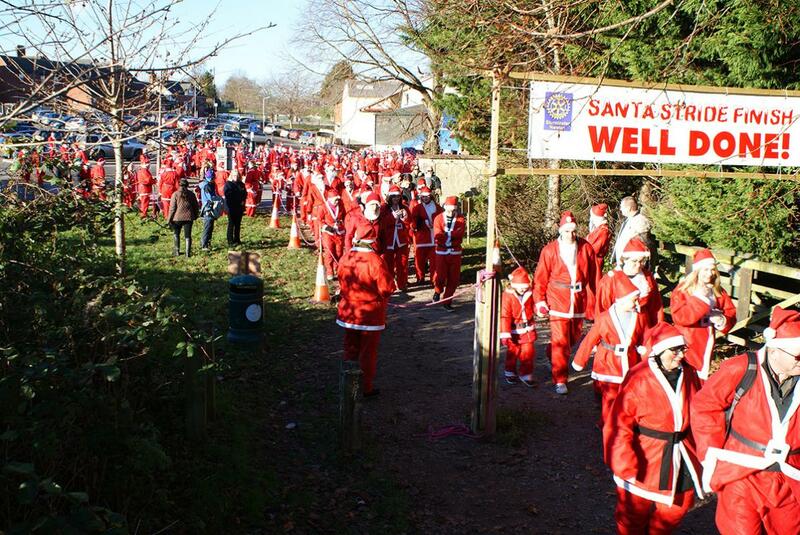 Starting from the beginning of the Trailway in Sturminster Newton on Sunday 2nd December (09:30 for runners and 11am for everyone else), hundreds of happy entrants will run, jog or walk up to 7 miles down the Trailway (towards Shillingstone and back) - dressed as Santa! Most entrants opt to wear the traditional Santa suit, however, the ladies Santa suit introduced last year is expected to be very popular again and this year there will also be a choice of suits for tinies up to 8 years old – a mini Santa suit or a very cute Elf costume! The cost of entry, subsidised by Rotary and including Santa suit and festive refreshments, is just £5 for Adults and £2.50 for children, with under 6-year olds free. Please download a sponsorship form when registering and collect sponsorship before the event for the incredible Somerset & Dorset Air Ambulance. Last year Santa Striders raised over £4000! We're also offering an exciting prize for the individual, family and group/business that manages to raise the most sponsorship! This hugely popular and friendly community event is a wonderful way of getting a bit of exercise before all those mince pies (!) whilst raising much-needed funds for our vitally important Air Ambulance. Individuals, families and groups are all very welcome, so dust off those boots and visit www.stursantastride.co.uk to register and to download your sponsorship form. Once registered, entrants will be able to collect their Santa suits before the event at the SERO Christmas Fair on the 17th November from 09:30 - 15:30 in The Exchange, Sturminster Newton. We’ll see you there! Ho Ho Ho!